The real-life story of a small ball of plutonium, the people it killed, and the researchers who blew it up. 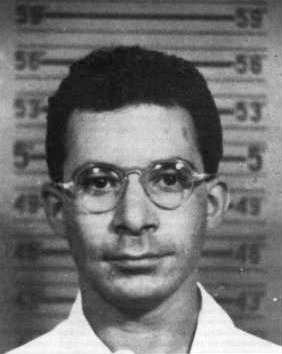 On the evening of Tuesday, August 21, 1945, American physicist Harry Daghlian was working at the U.S. government’s ultra-secret Los Alamos National Laboratory in New Mexico. He was performing a very delicate experiment: Daghlian was placing brick-shaped pieces of metal around a chunk of plutonium, the highly unstable fuel used in most nuclear bombs. And he was making it more unstable with every brick he placed around it. Daghlian (pronounced “DAHL-ee-an”) was part of the government’s Manhattan Project, which since 1942 had worked to develop the world’s first atomic bombs. And they succeeded: Just a few weeks before Daghlian’s experiment, two atomic bombs were dropped on the Japanese cities of Hiroshima and Nagasaki. The bombs had killed at least 100,000 people immediately, and many tens of thousands more in the days that followed. Less than a week after those bombings Japan surrendered to Allied Forces, ending World War II. For Daghlian and his fellow scientists, that meant there was much more work to do. The United States was the only country in the world with nuclear weapons at the time, but the government knew that wouldn’t be the case for long. If America was going to survive in a world with nuclear-armed enemies, it was reasoned, the nation was going to have to keep producing those weapons, and make them even more effective. This was precisely the reason that Daghlian was doing the particular work he was doing that night at Los Alamos. Harry Daghlian was just 24 years old. He’d been brought into the Manhattan Project in 1943, while he was still a physics student—an exceptionally brilliant one—at Indiana’s Purdue University. He had helped in the development of the bombs used in Japan, which, their devastating effects aside, were actually not very good nuclear bombs. They were, after all, only the second and third ever exploded (one test bomb had been detonated in New Mexico just three weeks before the two in Japan). One of the chief issues for the scientists was determining how to take full advantage of a bomb’s nuclear fuel. Amazingly, both bombs used in the attacks on Japan used only tiny fractions of their fuel to produce their explosions. And using a bomb’s fuel efficiently is all about the neutrons. The most common type of fuel used in nuclear weapons is a type of plutonium known as plutonium-239, or Pu-239. Pu-239 is naturally radioactive, meaning that its atoms naturally emit particles from their nuclei. Some of those particles are neutrons. (This is known as neutron radiation.) Neutrons are very large, as atomic particles go—so large that if a neutron emitted from one atom happens to strike another atom, it can actually “break” it, and cause the second atom to eject some of its own neutrons. This process happens normally very slowly, because most of the radiating neutrons just fly off. The whole idea behind nuclear weapons is to contain those neutrons within the plutonium, thereby speeding up the splitting process—with neutrons smashing atoms, causing more and more neutrons to be emitted, smashing more and more atoms—until it is completely out of control. The numbers involved in this chain reaction are almost too big to fathom: In a nuclear bomb explosion, atoms of the nuclear fuel are split by neutrons trillions and trillions of times…in hundreds of billionths of a second. Because each split of each atom releases energy, the combined splitting of trillions of atoms in such an impossibly short amount of time releases an absolutely phenomenal amount of energy—hence the power of atomic bombs. And that small box that Harry Daghlian was building that night in August 1945 was all about containing the neutrons. Daghlian was working with a gray, softball-sized sphere of Pu-239. It was basically the core, or pit, of a nuclear bomb—the part that does the exploding. He was performing experiments with the core to determine whether it was the proper size and density to sustain a chain reaction—so it could be used in an actual bomb. Daghlian wanted the chain reaction to increase to just below a critical state, meaning to a controlled chain reaction. He did not want the reaction to grow to a supercritical state, meaning one that was escalating completely out of control. Using the bricks, Daghlian built walls, about ten inches on a side and ten inches high, around the plutonium. He then took a brick and slowly positioned it—he was simply holding it in his hand—over the opening at the top of the structure, right over the core. The geiger counter clicked wildly. Enough neutrons were now being reflected back into the core that it was headed toward a supercritical state. Daghlian went to jerk the brick away…and dropped it. The brick landed right on top of the ball of plutonium. The plutonium was now effectively surrounded by neutron reflecting material, and it went supercritical immediately. There was a blue flash—an effect of the sudden release of radiation—and the geiger counter was screaming. Daghlian grabbed the dropped brick in a panic…and dropped it again. He tried to overturn the table he was working on—but it was too heavy. He finally just started taking the bricks away from around the plutonium, one by one. The chain reaction finally stopped, and the geiger counter quieted down. Roughly one minute had passed. It was one minute too much for Harry Daghlian. He had been exposed to a massive amount of radiation. Within hours he started feeling nauseated, the first sign of radiation sickness. He checked himself into a hospital. 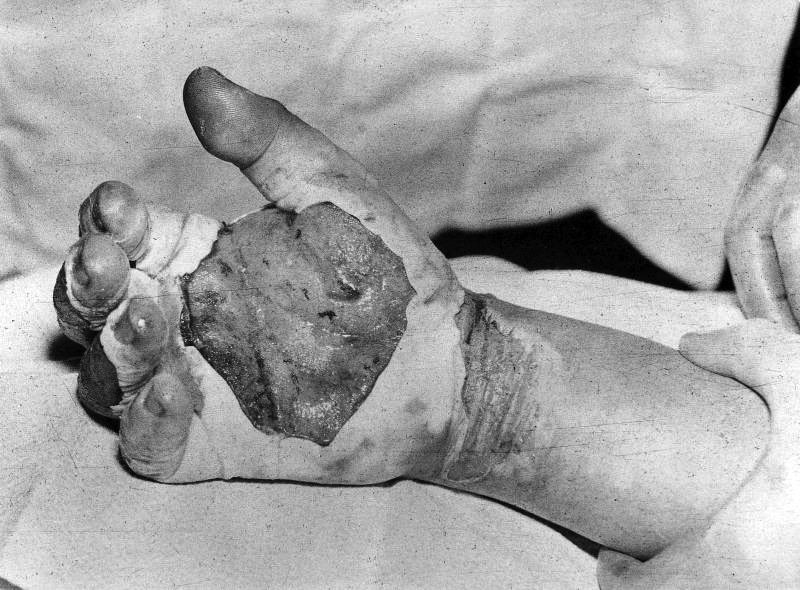 After a few days his hands, which had received the brunt of the radiation, began to blister due to radiation burns. He deteriorated steadily after that, and, on September 15, twenty-five days after the accident, Harry Daghlian died. Nine months after Daghlian’s death, in May 1946, the core that he had been experimenting on was designated for use in an actual bomb, to be exploded in a test over the Pacific Ocean. On May 21, Louis Slotin, Daghlian’s friend and colleague (he had been on vacation during the accident) decided to perform one last experiment on it. Slotin’s experiment was similar to Daghlian’s, but instead of using bricks of tungsten carbide, he had two bowl-like hemispheres made of beryllium—another metal that acts as a neutron reflector. (The two hemispheres could be put together to form a hollow ball; the hollow was just the right size to hold the plutonium core.) One of the hemispheres sat in a frame on a table. 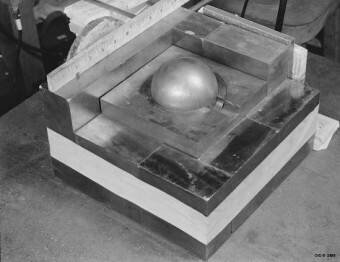 Slotin placed the plutonium core in it, then placed the other hemisphere over the top of the core…but not all the way. He could not cover the core and allow it to be completely surrounded by the neutron-reflecting beryllium or, as happened to Daghlian, an uncontrolled chain reaction would start. But that’s exactly what happened. The experiment Slotin was performing with the beryllium hemispheres required him to insert the tip of an ordinary screwdriver (yes, a screwdriver) under the lip of the beryllium cap, and raise it and lower it, noting by use of a geiger counter how much of a chain reaction was being created. He was also supposed to be using safety wedges, which would insure that if the screwdriver slipped, the beryllium cap wouldn’t fall and cover the core. But Slotin didn’t use the wedges…and the screwdriver slipped. The beryllium cap fell, the core became completely contained, and it immediately went supercritical. Even worse: There were seven other people standing around the table, watching Slotin work. As with Daghlian’s accident, there was an instant blue flash, and the geiger counter started ticking wildly. (The people in the room later said they also felt a surge of heat.) To Slotin’s great credit, he immediately put himself at enormous risk by prying the spheres apart—with his bare hands—thereby stopping the reaction. In doing so he received a dose of radiation several times greater than Daghlian had. The effect came almost immediately; he was already vomiting as walked out of the lab. Nine days later, after what can only be described as a period of horrible suffering, Slotin died. 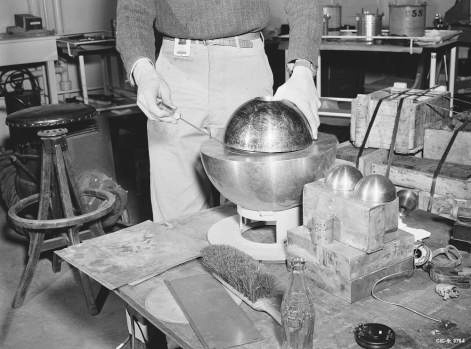 The “Demon Core,” as it was soon known by scientists at Los Alamos, had killed its second victim. Army Private Robert J. Hemmerly, 29, was serving as a guard in the lab when Daghlian’s accident took place. He was at a desk reading a newspaper at the far end of the lab when he saw the blue flash. He died 33 years later, at the age of 62, of leukemia, which is believed to have been brought on by his exposure to radiation during the accident. Alvin Graves was the person closest to Slotin during his accident. Slotin’s action in separating the hemispheres partially shielded Graves, but he was hospitalized for several weeks with severe radiation poisoning nonetheless. He developed several lasting health problems, including vision loss, and died 18 years later, at the age of 55, of radiation-related complications. Of the six others in the room with Slotin, three are believed to have had their lives significantly shortened by the Demon Core. On July 1, 1946, the softball-sized core of Pu-239 that had killed two of America’s most important scientists was detonated near the Bikini Islands in the Pacific Ocean, in the fourth nuclear bomb explosion in history. The Demon Core was no more. 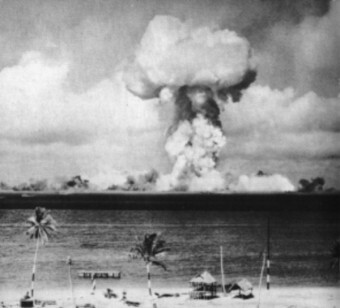 The Bikini bomb test that finished off the Demon Core used a much higher percentage of its nuclear fuel than its predecessors and was more powerful by several kilotons (the explosive force of a thousand tons of TNT). Several unmanned ships were anchored in the drop zone to study the bomb’s effects. Locked in several of those ships were 57 guinea pigs, 109 mice, 146 pigs, 176 goats, and 3,030 white rats. They were there so scientists could study the effects of nuclear bombs on animals. The bomb killed 10 percent of them immediately; most of the remainder died of radiation poisoning in the weeks that followed. At least one of those animals escaped the wrath of the Demon Core, and got a bit of celebrity doing it: A 50-pound pig known as “Pig 311” was aboard an old war ship in the drop zone. (She was locked in the ship’s officers’ toilet.) The detonation sank the ship—but sailors later found Pig 311 swimming in the ocean. She was taken to the Naval Medical Research Institute in Bethesda, Maryland, where she lived for the next three years—growing to a mammoth 600 pounds. In 1949, Pig 311 was given to the National Zoo in Washington, D.C., where she became one of their most popular displays. She died there in 1950. If you want a better picture of just what Louis Slotin was doing in his experiment, watch the 1989 film Fat Man and Little Boy about the Manhattan Project. In it, John Cusack plays a scientist who performs a fairly accurate version of Slotin’s accident. 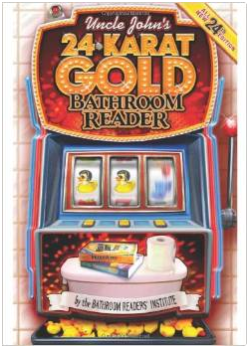 This article is reprinted with permission from Uncle John’s 24 Karat Gold Bathroom Reader. The information miners at the Bathroom Readers’ Institute have unearthed a priceless collection of surprising, amazing, headscratching, and hilarious articles. 24-Karat Gold is chock-full of little-known history, random origins, weird news, celebrity secrets, and urban legends.